Shortly after Castro’s famous speech, the process of gun confiscation started in Cuba—but gradually. Initially it was aimed at disarming rival revolutionary groups, who had fought Batista but weren’t Communist-backed. Soon the definition of these “rival revolutionaries” grew pretty sweeping. Soon it included just about every Cuban with a gun. Significantly, Castro’s famous anti-gun speech was proclaimed a full two years BEFORE he came out of the closet as a full-fledged Marxist-Leninist. 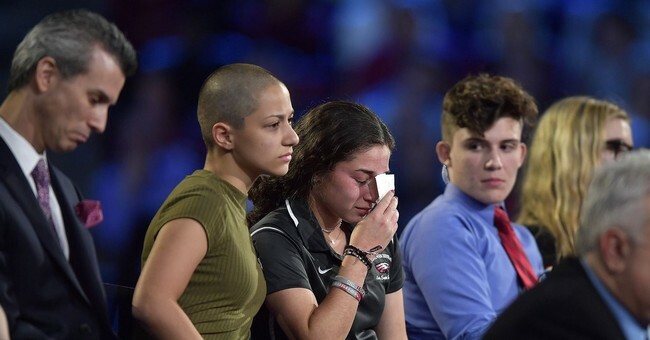 In a fascinating irony it turns out that Parkland high school student and sudden media rock-star Emma Gonzales was born in the U.S. of a Cuban-born parent. It appears that her father graciously found refuge in the U.S. from the horrors of totalitarian, gun-outlawing Cuba in 1968. Alas-- this fascinating item is only being reported in Spanish-language media. Over the past week Castro’s media has been in a tizzy celebrating the Parkland high school students and especially Emma Gonzalez's NRA and Republican bashing. So when will these Democrat Parkland protestors “disavow” their championship by a murderous (and child-murdering) totalitarian regime? After all, isn’t the Democrat-Media complex constantly haranguing Republicans to “disavow” any compliments from the KKK, Alt-Right, etc.? As it turns out the few guns still in the hands of (mostly redneck) Cubans from 1960-1966 caused great panic for the Soviet satrap Castroites. These few guns resulted in the only genuine Cuban guerrilla war of the 20th century. And it can’t be repeated often enough—it was fought AGAINST the utterly bogus “guerrillas” Fidel Castro and Che Guevara. Farm collectivization was no more voluntary in Cuba than in the Ukraine. And Cuba's Kulaks (rednecks) had guns, a few at first anyway. Around 1960 thousands of Cuba’s enraged campesinos grabbed their guns and started fighting desperately as Castro and Che started stealing their land to build Soviet Kolkhozes, while murdering and jailing all who resisted. I won’t bother asking if you’ve ever heard of this ferocious insurgency on our very doorstep from The FAKE History Channel, FAKE News Media, or your professors, amigos. These valiant and desperate insurgents were fighting the Left’s premier pin-up boys: Fidel Castro and Che Guevara. That’s all you need to know about the media/ Hollywood silence. This (thoroughly-documented) insurgency turns on its very head everything the Media/Hollywood complex would have us believe about Che Guevara and Fidel Castro. Alarmed by the widespread and savage insurgency, Castro and Che sent a special emissary named Flavio Bravo whimpering to their sugar-daddy Khrushchev. “We are on a crusade against kulaks like you were in 1930,” whimpered this old–line Cuban Communist party member. In short order, Soviet military “advisors,” still flush from their success against their own campesinos in the Ukrainian Holocaust were rushed to Cuba. This anti-Stalinist rebellion 90 miles from U.S. shores and involving ten times the number of rebels, ten times the casualties and lasting twice as long as the puerile skirmish against Batista, found no intrepid U.S. reporters anywhere near Cuba’s hills. What came to be known as The Bay of Pigs invasion was originally planned as a link-up with the Cuban resistance of the time, which was more numerous (per-capita) than the French resistance before D-Day. Che Guevara had a very bloody (and typically cowardly) hand in one of the major anti-insurgency wars on this continent. Most of these anti-communist redneck/guerrillas were executed on the spot upon capture, a Che specialty. "We fought with the fury of cornered beasts," said one to describe their desperate freedom fight against the Soviet occupation of Cuba through their proxies Fidel Castro and Che Guevara. After all, in 1956 when Che linked up with Fidel, Raul, and their Cuban chums in Mexico city, one of them (now in exile) recalls Che railing against the Hungarian freedom-fighters as "Fascists!" and cheering their extermination by Soviet tanks. In 1962 Che got a chance to do more than cheer from the sidelines. He had a hand in the following: "Cuban militia units commanded by Russian officers employed flame-throwers to burn the palm-thatched cottages in the Escambray countryside. The peasant occupants were accused of feeding the counterrevolutionaries and bandits." At one point in 1962, one of every 17 Cubans was a political prisoner. Fidel himself admits that they faced 179 bands of "counter-revolutionaries" and "bandits." Mass murder was the order in Cuba's countryside. It was the only way to decimate so many rebels. These Cuban country folk went after the gun-grabbing communists with a ferocity that—as mentioned--saw Fidel and Che running to their Soviet sugar daddies and tugging their pants in panic. Little wonder their earlier panic to confiscate all guns from the countrymen of Emma Gonzalez’s father.